Nishikoi Sinking Fish Food provides an ideal diet for Sterlets, sturgeon, tench and other bottom feeding pond fish. With its high protein formulation, Nishikoi Sinking Food stimulates excellent growth in all bottom feeding fish. The protein is highly digestable which allows your fish to utilise it more efficiently, helping to keep waste to a minimum and your pond water cleaner. The high performance colour enhancing formula also ensures that any ornamental bottom feeding fish will show off their true colours to the full. The high stabilised Vitamin C content provides your fish with a much needed health boost, helping to protect them from disease. 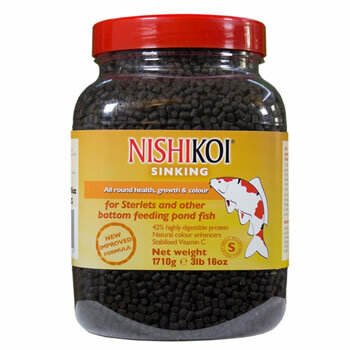 Nishikoi Sinking Fish Food provides an ideal diet for Sterlets, sturgeon, tench and other bottom feeding pond fish. With its high protein formulation, Nishikoi Sinking Food stimulates excellent growth in all bottom feeding fish. The protein is highly digestable which allows your fish to utilise it more efficiently, helping to keep waste to a minimum and your pond water cleaner. The high performance colour enhancing formula also ensures that any ornamental bottom feeding fish will show off their true colours to the full. The high stabilised Vitamin C content provides your fish with a much needed health boost, helping to protect them from disease.